Like a professional athlete or famous band, NASA astronauts need practice before they take the main stage. In this case, the stage isn't Madison Square Garden or some other historic venue, but an asteroid from space—and the entire Earth is the audience. NASA last week said it has already begun underwater tests in preparation for a mission to an asteroid, which the agency hopes will occur sometime in the 2020s. I smell an Armageddon sequel coming. 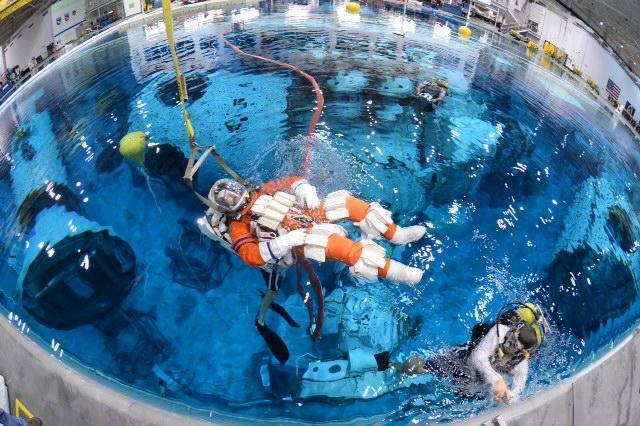 In a 40-foot-deep swimming pool in Houston, NASA is already testing modified versions of shuttle launch and entry suits in an effort to simulate the gravity of space. "We're working on the techniques and tools we might use someday to explore a small asteroid that was captured from an orbit around the sun and brought back by a robot spacecraft to orbit around the moon," said Stan Love, a veteran of shuttle mission spacewalks. "When it's there, we can send people there to take samples and take a look at it up close." NASA says one of its primary goals for visiting an asteroid is to obtain a sample that shows its layers, which could potentially provide information about how old our solar system truly is. NASA is already working to identify an asteroid for capture, but if you have any bright ideas on how to make the mission work, you can chime in with your own thoughts. If successful, landing a human on a captured asteroid could pave the way for a possible Mars mission by the 2030s.